Wheat is a grain which is the basis of many different kinds of food. Ground into flour it is the basis for most of the bread and pasta eaten in the world. The whole grains can be boiled and used like rice. With some processing, wheat is converted into couscous and bulgur wheat, which both are easier to cook and used like rice. 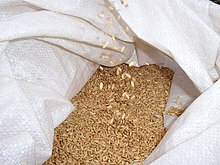 Wheat berries (unprocessed seed) are also grown to make wheat grass juice. This page was last edited on 10 January 2007, at 06:02.